Our productivity is measured in megabits. 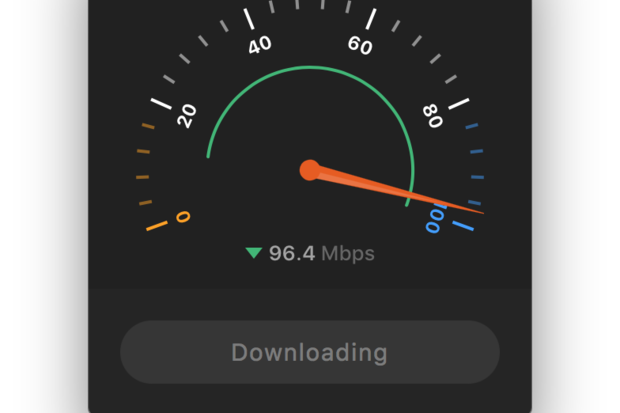 No matter how fast the processors are or how much RAM we have installed, our Macs are only as efficient as the Internet connections they receive; in this age of always-on apps and streaming everything, downloads speeds are king, and even a slight dip in bandwidth can make or break your day. Whether you rely on the Internet for work or play, you want to make sure your connection is always running at its optimal speed (or just something close to what you pay for). There are numerous ways to do so right in your browser, with Ookla’s speedtest.net setting the bar with a reliable tool that doesn’t use Flash. But like most browser tests, it’s not exactly elegant, with several banner ads surrounding the testing screen, and some may have concerns over the potential for viruses or malware. Speedster was designed as an alternative to the browser utility. Minimal without being too plain, the app mimics a car’s speedometer, with a needle tracking speeds all the way up to 100 Mbps. Clicking on the Start Test button finds the closest server and churns through a barrage of tests, downloading and uploading files of varying sizes until it reaches one that takes longer than eight seconds. It then averages the totals together to generate your final score, which is for your eyes only (unless you choose to share it). 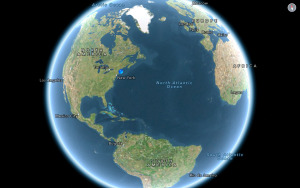 If you’re concerned about accuracy, Speedster promises that the SpeedOf.Me API it uses is “more accurate and representative of your actual Internet quality.” While that claim is difficult to prove, the results received from Speedster were consistent with ones delivered by a variety of comparison browser tests, so it’s at least as accurate as traditional tools. But while Speedster’s simplicity and accuracy are certainly enough to garner a recommendation, the app doesn’t quite feel complete. The most glaring omission is the lack of a menu bar icon. Speedster is designed to be used quickly and often, but launching it from the Dock each time is somewhat tedious; besides, the one-trick functionality and iOS-like design is tailor-made for the menu bar, and it seems like a no-brainer for a future update. 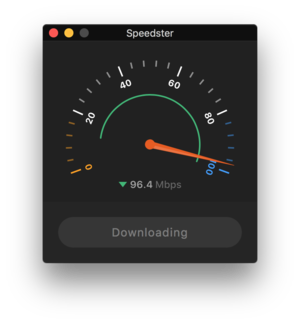 Speedster is a free download from the Mac App Store, and since it doesn’t sully its window with ads, users shouldn’t be surprised by its bare-boned interface and limit of three daily tests. However, while in-app-purchases unlocks the number of tests you can do per week ($3 for 100 tests, $9 for 500 tests, and $15 for 1,000 tests), it surprisingly doesn’t add any extra functionality. 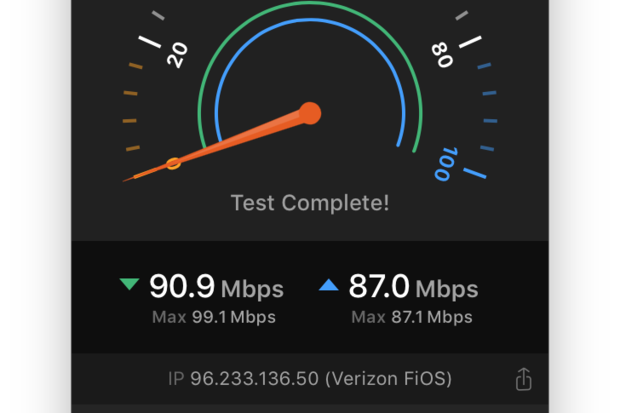 There is a complete lack of preferences or options in either version of the app, and some distinct features are missing, most notably a mechanism for checking the ping latency of your connection, a standard component of most any other testing tool. And while the locally encrypted results are certainly welcome, it would be nice to be able to browse an automated log of prior tests to track fluctuations. 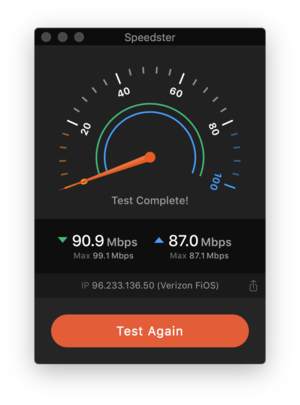 For most users, the free version of Speedster will be perfectly fine, bringing a touch of class to the mundane task of testing your Internet connection. But with a few more premium features, it could become one of the most essential utilities on your Mac. Speedster lets you test your Internet connection without opening your browser, but power users will be slowed down by its lack of features. Editor’s note: Updated on 3/17/16 at 9:14 a.m. PT to correct the pricing for in-app purchases.